Good morning everyone. How are we feeling? Like me, you are probably still digesting that gut bomb from last night. Lets be honest. Turkey is a very small part of your Thanksgiving meal. I had two slices last night. Two! But, I went back multiple times for stuffing, gravy, mashed potatoes, and all of those wonderful sides. You will also be eating the leftovers until at some point in the weekend where you will say "Enough!". Well, here is something nice and light that you might like to try when you reach that point. Cioppino. Cioppino is a dish made in San Francisco. I was introduced to this dish on my first visit to the city by the bay. It was love at first sight. 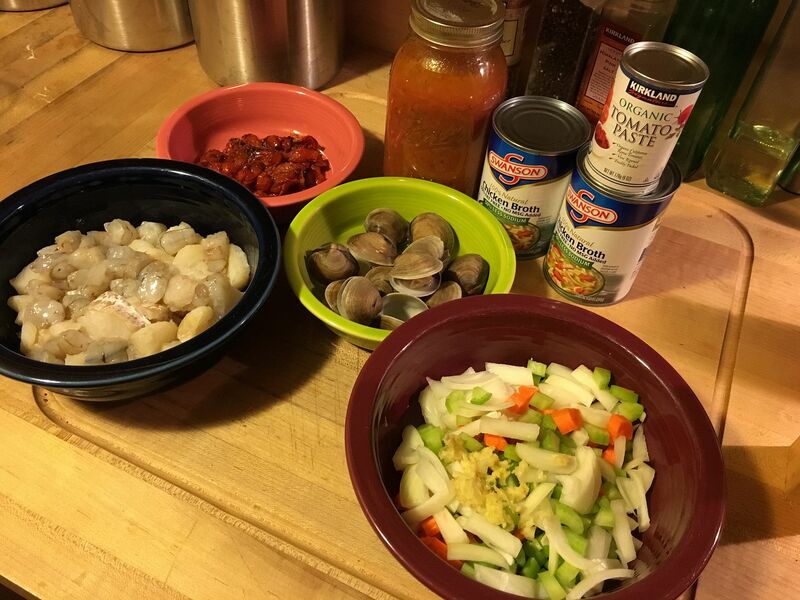 Cioppino is basically a seafood stew made primarily with a firm white fish, generally cod, as well as mussels and clams. I have even seen Dungeness crab used. We usually pick up what is on sale for our Cioppino. This time it was cod, shrimp, and clams. 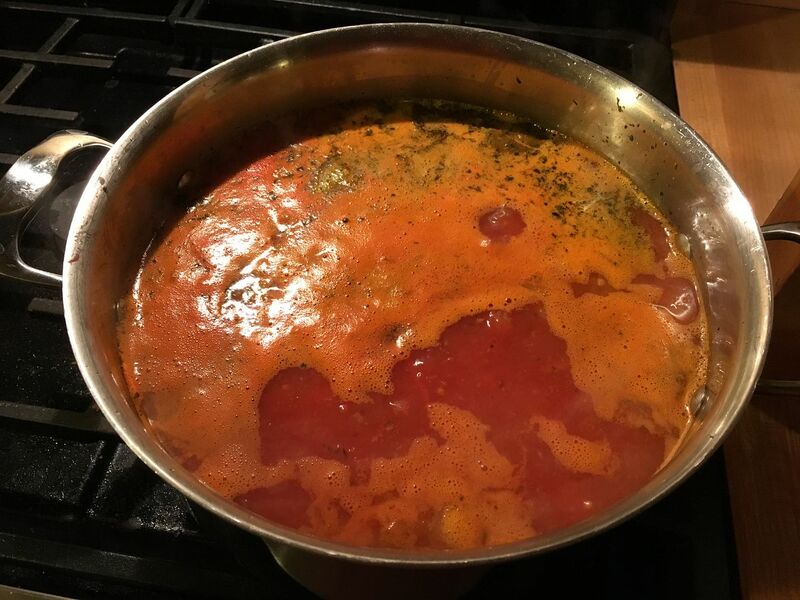 1 quart homemade canned tomato sauce with Italian spices added. 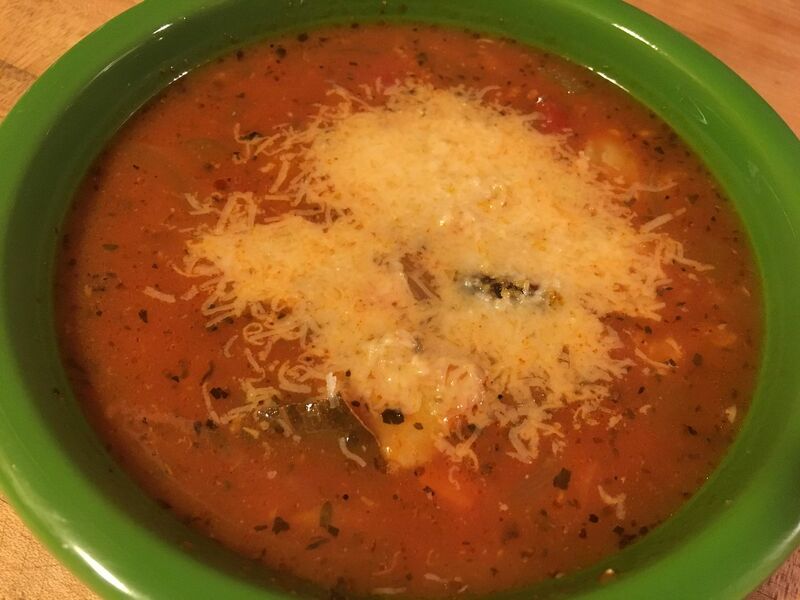 You could use the large can of plain from the store and add basil, oregano, thyme, and garlic to your taste. 1 dozen clams and their juice. We bought the frozen, precooked clams. Don't judge. They're going into stew, ok? First, I brought my oven to 350 F, placed the cherry tomatoes into a 9 x 11 baking dish with one tablespoon of olive oil, plus salt and pepper to taste, and roasted for one hour. I stirred them thirty minutes into the roasting process. What you would like to see after one hour is a tomato that has popped and started to caramelize a bit. Makes great pizza topping as well. But, I digress. 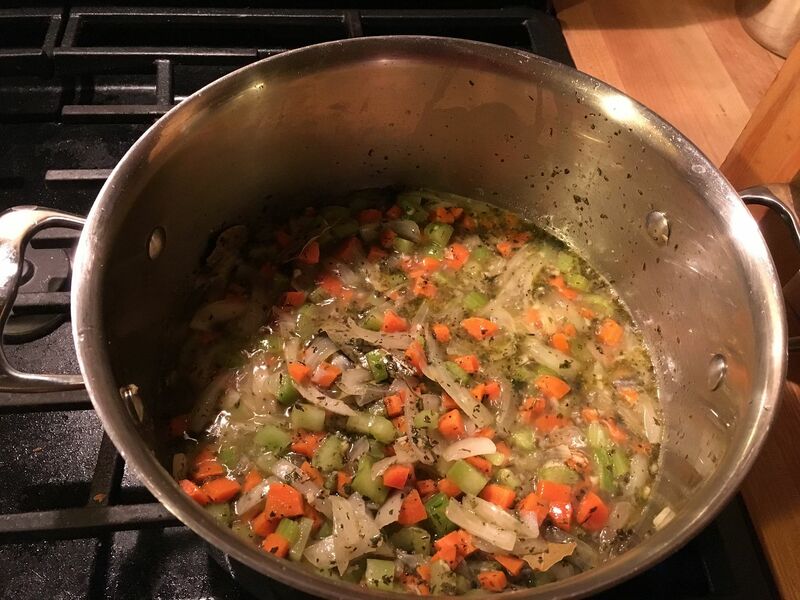 Next, I added two tablespoons of olive oil to my five quart dutch oven, turned the heat to medium, and added the onions, carrots, and celery with some kosher salt and ground black pepper. 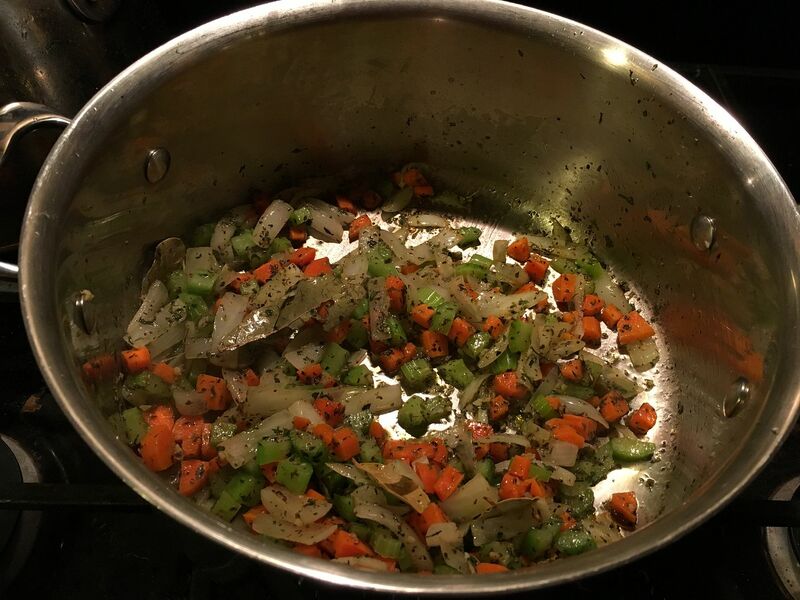 I sauteed until the onion started to turn translucent. Then, I added my spices and sauteed two minutes more. Next, I deglazed the pan with the white wine, then cooked until the wine had reduced in volume by 1/2. Next, I added my tomato sauce, tomato paste/water mixture, and chicken broth. Then I brought to a boil, reduced the heat, and simmered for one hour with the lid cracked to slightly reduce the liquid while simmering. After the hour of simmer time, I added the pasta and seafood, brought back to a simmer, and cooked for seven more minutes. At the very end, I added my roasted cherry tomatoes and stirred to mix. That's it, ready to serve. I topped with grated Parmesan cheese and served with a salad and crusty bread. A nice light meal during the heavy holiday meal season. Like I said, my Cioppino is never the same twice. You could adapt this dish and make it spicy. You could add whatever seafood you like, just as long as it is of a firm variety. Take this idea a run with it. That looks wonderful. I have lived in the Bay Area my whole life and never had Cioppino. I guess it is about time. Next to garlic crab with sourdough, this is my favorite Bay Area dish Chilebrown.